Well, it finally happened — the little red hen went over the fence this morning, and before I could get my robe on and get out there, Raymond (bad dog!) had done her in. I sort of figured I’d lose one to dogs before it was all over, but frankly, why couldn’t it have been the problematic rooster (who could also have given him a run for his money)? Ray’s in the doghouse — no breakfast, bark collar turned to high, not looking at him, locked in the front yard where he can’t even go look at the chickens or go roll in the scene of his crime. Bad Dog. 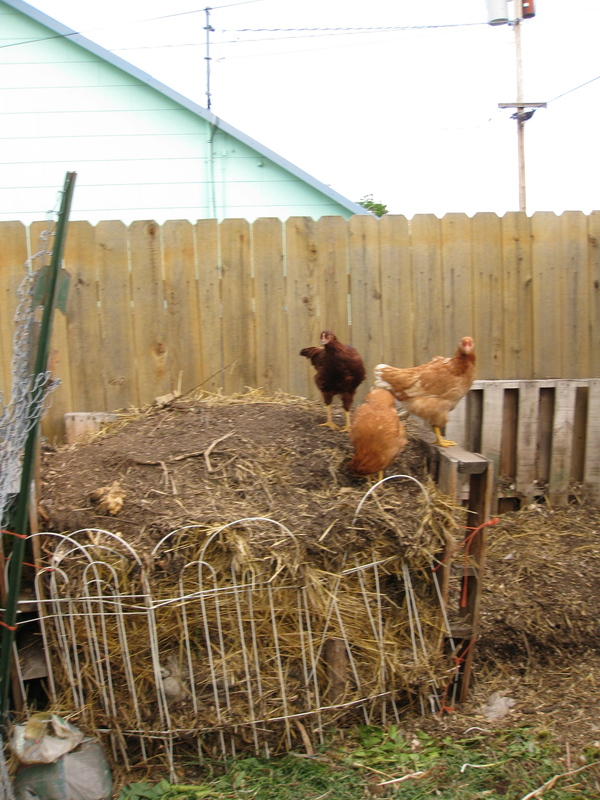 And the other two hens, and the problematic rooster, are hiding under the chicken coop. They came out briefly when I took them some leftover spaghetti and the diced red potatoes that mysteriously refused to cook (another story, but they went from hard to rubbery without ever really tasting cooked). But they seem to have decided that in this dangerous world, they’re going to huddle under the coop. Oh dear. This is why I am not keen to keep poultry. In France my friend Kathy fights a losing battle with the local foxes, stoats and rats and it’s so difficult when one of them successfully makes off with a hen or duck. But on the positive side, the fresh eggs and delicious and hunting for them in the hedges and ditches was a pleasant task. Life, death…. I’m sorry to hear that. I’ve so far lost four of mine to my own dogs (three of those were all in the same day). I’ve lost a few more to wild predators. I’ve learned to heavily pad the number I keep above what I think I need. I seem to need to start out with about twice as many as I really want. I live in the country, though. In town, in a fenced yard, I’d still pad but not as much. Oh, and roosters NEVER get caught! Good luck – I hope the rest stay safe. Bark collar turned to high? Shame on you for even using a bark collar! Hmm Kira — judgy much? The computerized bark collar has saved all of our sanities — Ray is reminded to behave, the neighbors don’t hate us anymore, and I don’t have to yell at him all day. His brain isn’t much bigger than the chickens’ and no matter what training methods we tried, he barks at everything. And I work at home (which in this economy puts my job in jeopardy), so I can’t have him exploding when I’m in the middle of a conference call. I’ve had it shock me — it’s startling, but not painful. No I am not “judgy” just honest. I work in animal rescue and bark collars are inhumane. Your skin and body makeup is different from a dogs, so you are feeling a complete different sensation. It’s a shame you chose to “turn Ray’s dog collar to high” and punish the dog for doing what dogs normally do. You can’t expect your dog to be a cow. You should punish yourself for allowing that situation to happen in the first place. Perhaps you meant that metaphorically, but either way … YOU deserve the shock collar.